BUFFALO, N.Y. -- The University at Buffalo women's soccer team (9-2-0, 3-1-0 MAC) picked up their ninth win in their last 10 matches on Sunday afternoon as Kaitlyn Walsh ended the match in the 95th minute with the game-winning goal. The win in overtime for the Bulls was their first of the season as they improved to 5-0 on their home turf at UB Stadium. The Eagles had the best scoring chance early as in the ninth minute Kriston Nason sent a cross into the box where Sabrina McNeil took a shot that trickled just wide right of the UB goal. In the 16th minute, Andrea Judasz found the loose ball after a corner by Gurjeena Jandu but her hard low shot just missed the left corner of the net to keep the match scoreless. Marcy Barberic had a good scoring chance in the 20th minute as Gurjeena Jandu found Carissima Cutrona who fed Barberic free on the right side of the net but her shot was grabbed by the EMU keeper. In the 23rd minute, Kaitlyn Walsh fed a hard low pass into the box where Gianna Yurchak got a foot on the ball but her attempt went over the cross bar. The Eagles netted the first goal of the match in the 29th minute as Lindsey Shira passed the ball to Kristin Nason who crossed a great ball into the box to Alia Frederick who buried the ball into the right corner of the UB goal. Carissima Cutrona had a strong chance in the 37th minute as Carley Zoccali headed her a ball but her one-time attempt was blasted over the EMU cage. The Eagles had the first chance of the second half as in the 48th minute Sabrina McNeil ripped a low shot from the left side of the cage that missed the lower right corner to keep the score 1-0 in favor of EMU. 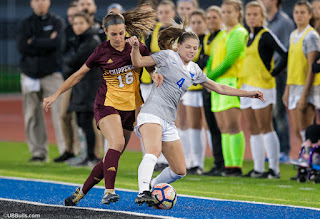 Buffalo was able to tie the match, 1-1, in the 49th minute as Andrea Judasz connected with Katherine Camper who found Carissima Cutrona on the left side of the EMU goal and she beat the keeper to the left post for her eighth goal of the season. Emily Kelly came up with a huge save in the 56th minute as Mikayla Kupp put Kristin Nason in all alone of the UB goal but Kelly stoned the EMU striker with a quick save and the ball bounced out of play. Buffalo had a good chance for the go-ahead goal in the 60th minute as Marcy Barberic crossed a perfect ball into the box where Carley Zoccali chipped a shot just over the EMU cage. In the 72nd minute, Sabrina McNeil l ripped a shot over the outstretched arm of Emily Kelly but it struck the cross bar and popped back into play. Parys Kerr collected the rebound and took a shot right on goal but Emily Kelly made the stop to keep the game knotted, 1-1. Carissima Cutrona had a great scoring chance in the 80th minute as she ripped a shot destined for the left corner of the net but Kaylin Williams made a great diving stop to her right to poke the ball out of bounds. Three minutes later, Marcy Barberic found Carissima Cutrona in front of the Eagles goal but Williams came up with another save. After the Eagles had the first two chances in overtime, the Bulls were able to end the match in the 95th minute as Gurjeena Jandu sent a cross into the box where Kaitlyn Walsh gathered the ball and buried the game-winner into the lower left corner of the EMU net. With the win, the Bulls improve to 4-0-2 against Eastern Michigan in their last six meetings. Buffalo improved to 32-5-7 inside UB Stadium including a perfect 5-0 record this season since head coach Shawn Burke took over the program prior to the 2014 season. The nine wins for UB are the most in a season since they won 11 matches in 2015. Senior Carissima Cutrona netted her 28th career goal in the second half as she now ranks sixth in program history in goals in a career. She also has set a new career-high with 24 points on the season, eight goals and eight assists. Freshman goalkeeper Emily Kelly collected her ninth win of the season as she moved into sixth place for wins in a season by a Buffalo goalkeeper. The overtime victory was also the first of her collegiate career. The game-winning goal for Kaitlyn Walsh was the second of the season for the sophomore. Walsh now has a career-high four goals and three assists on the season. Gurjeena Jandu notched her sixth assist of the season, a career-high, on Walsh's game-winner. For the match, Buffalo held the 17-10 edge in shots and the 7-4 advantage in corner kicks. Senior Carissima Cutrona led the Bulls with five shots, four on goal, while Kaitlyn Walsh, Gianna Yurchak, Marcy Barberic and Carley Zoccali each recorded two shots in the win. Freshman Emily Kelly finished off her ninth win with four saves while Kaylin Williams made six saves in the loss for EMU. Following the match, the UB coaching staff selected Marcy Barberic as the Player of the Match after her impressive match up top for the Bulls during their overtime victory against EMU. The Bulls will hit the road on Thursday night as they open up October with a road match against the Kent State Golden Flashes. Thursday's match is set to kickoff at 7:00 pm.